The H.Upmann Magnum 56 Limited Edition 2015 is a tasty and powerful cigar, with 56 ring gauge, 5.9” (150mm) long and comes in a box of 25 cigars. 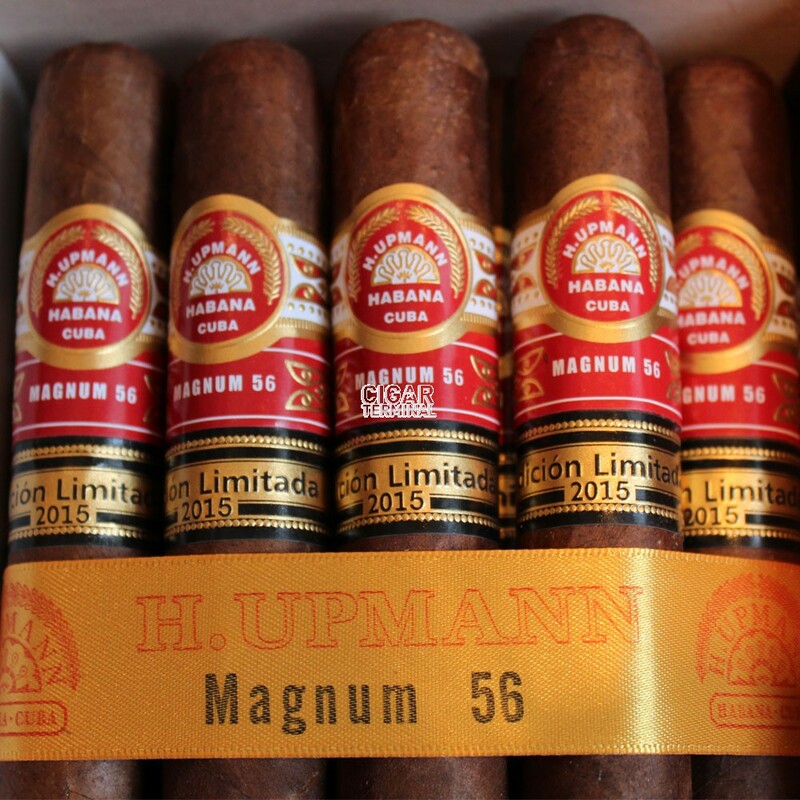 The H.Upmann Magnum 56 Limited Edition 2015 is an elegant and powerful cigar that will please experienced smokers. • Rich and complex cigar, with lots of spice, cream, musky and toasted flavors. • Its superb construction allows it to age beautifully. Try this cigar while you still can as there are only a numbered of boxes available. The H.Upmann Magnum 56 Limited Edition 2015 is a beautiful cigar with a superb appearance. The wrapper is of dark brown color (Colorado Maduro tint), with a nice oil sheen on the surface. It is tightly rolled using an aged wrapper leaf. 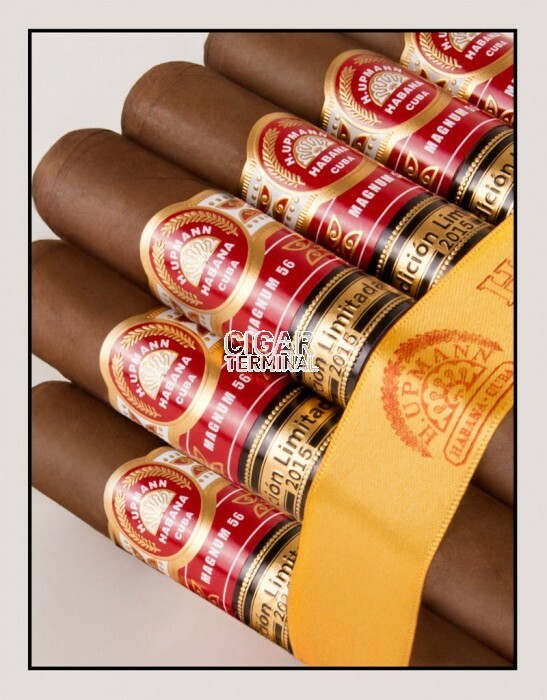 The cigar is smooth to the touch and in addition to the regular H.Upmann band; it is sporting a second golden band that reads “Edicion Limitada 2015”. At cold, the wrapper emanates some sweet flavors. There are some notes of leather and of chocolate, with some hints of wood. The pre-light draw gives some sweet and smooth flavors, there is also some white pepper notes. The wrapper leaves some saltiness on the lips. Once the cap has been cut-off, the Magnum 56 LE offers a perfect draw, which remains great throughout. The burn line is fine and even if it is a bit wavy at times, it doesn’t require attention. The smoke that goes out from the cigar is rich and creamy. The first third of the cigar is dominated by rich and musky flavors. The leather is predominant while there are also some notes of earth, of roasted nuts and roasted bread. The cigar is creamy and rich, the flavors are round and balanced. There is some creaminess, spiciness from white pepper, some “smoked“ and very musky notes. The body of the cigar is at a medium level for the first third. In the middle third, the strength ramps up, reaching now a medium-full body. In terms of flavors, the leather becomes predominant, but there is also the appearance of some flavors of roasted coffee beans and of nuts. There are also some sweet notes of roasted nuts, melted butter and of grilled steak. The spices are still powerful but overall the cigar is well balanced and delicious. In the final third, the flavor profile doesn’t evolve much, it is becoming slightly more powerful, almost a full body at this point. The finish is stronger too, but there is neither bitterness nor sourness. The spiciness is also more pronounced. The cigar doesn’t burn too hot and can be smoked until the nub. In summary, despite being a young cigar, it is already a great powerful smoke of toasty flavors.